The queen of Vespas has received the latest in high-tech rider aids, with both ABS and traction control. The single-cylinder four-stroke buzzes underneath me as I’m sitting on a comfortable seat while smelling spring air in Tuscany, and I notice the butterflies in the fields covered in yellow spring flowers. It’s good to be liberated by the warming sun. The essence of the Vespone lies in new high-tech features, giving more piece of mind on a slippery road. The ASR traction control takes care of sudden slips over a manhole cover or wet leaves, while the ABS gives safe braking power in all conditions. This is good news on the GTS, as it’s a little more powerful than other Vespa scooters. The 278cc Single is claimed to produce 21.2 horsepower at 7500 rpm, while a peak of 16.4 ft-lb of torque is available at 5250 rpm. It has more oomph all over its register than previous models. The Vespa GTS has superb acceleration for a scooter, and its midrange has been improved compared to previous models. Twist the grip and there’s enough to overtake cars even at speeds above 60 mph. Vespa says it tops out at 80 mph. But, no matter what speed you’re traveling, the seamless transmission works in a very smooth manner. The GTS is great for both town and country lanes, as it offers a flexible engine which easily allows a pillion passenger to travel with you for many miles at a time. The ASR traction control demonstrated its usefulness many times during the test ride, from leaving the gravel road leading from the hotel to accelerating over dirt littered on the roads. The ASR is pretty intrusive for maximum safety, but it’s okay because we’re talking about a 21-hp Vespa scooter here and not a 150-hp superbike. Under the new front suspension sits a disc brake with dual-channel ABS, backed up by a rear disc brake, which isn’t typical for Vespas. The system is able to stop the GTS with great safety. 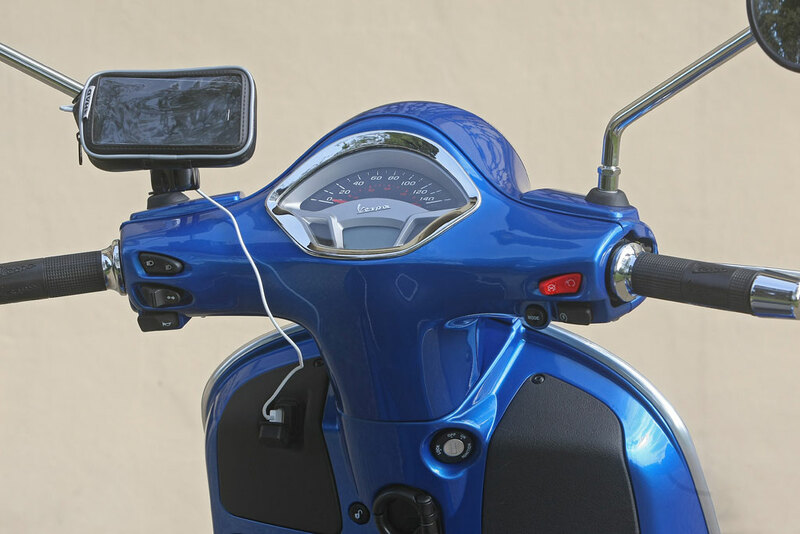 The GTS Super includes Vespa’s new multimedia platform, which connects a smartphone to the bike via a USB cable. Vespa’s app can display a host of data from the ABS/ASR-equipped GTS such as torque output at any given rpm, lean angle and much more. If you park your Vespa in a gaggle of other scooters, it’s reassuring that the VMP app knows exactly where your bike is by using GPS coordinates. The GTS is very high-tech, but only on the ASR/ABS version. The GTS Super gets special wheels, wheel trim and new paint in the blue gaiola color. 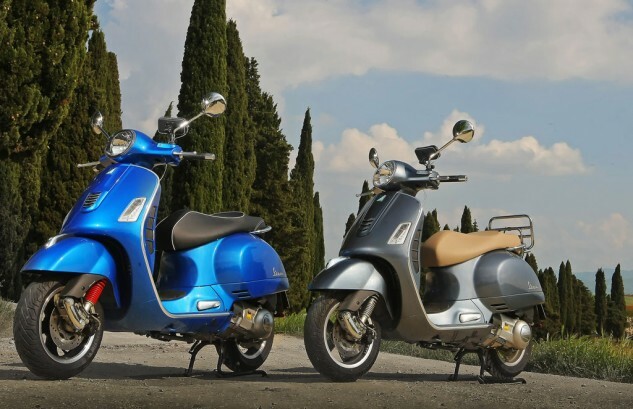 Vespa says to expect fuel economy numbers around 70 mpg, yielding a theoretical range of at least 150 miles. 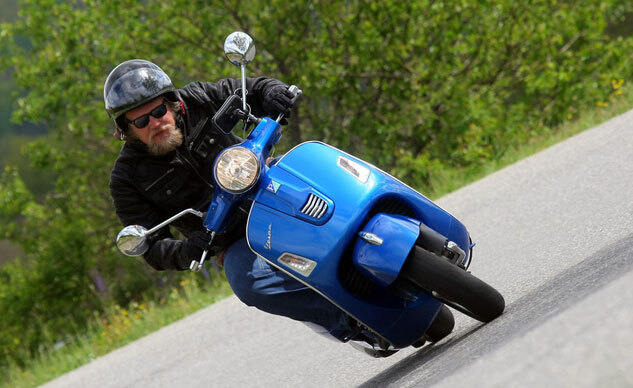 As with other Vespas, the GTS body is made of steel to ensure longevity and good second-hand value. 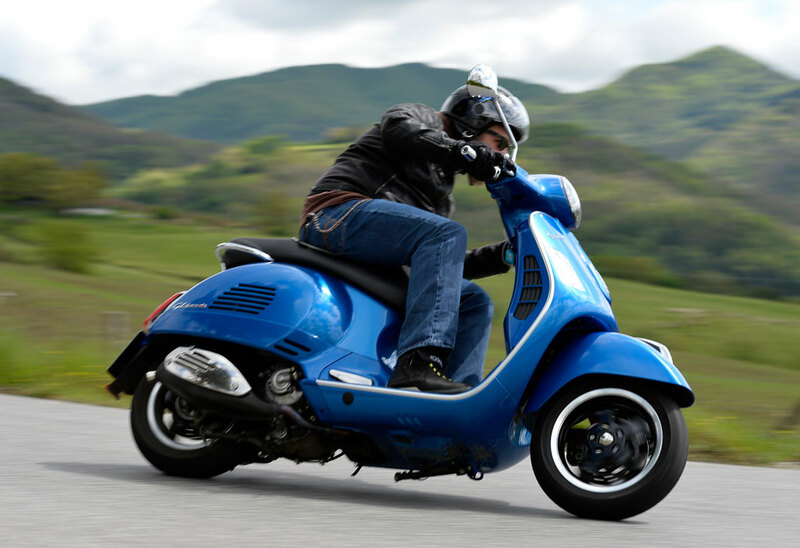 The Vespa GTS 300 Super ABS is a solid choice for scooterists who appreciate Italian design and the safety offered by its electronic systems. It doesn’t hurt that it looks pretty classy and classic, too. 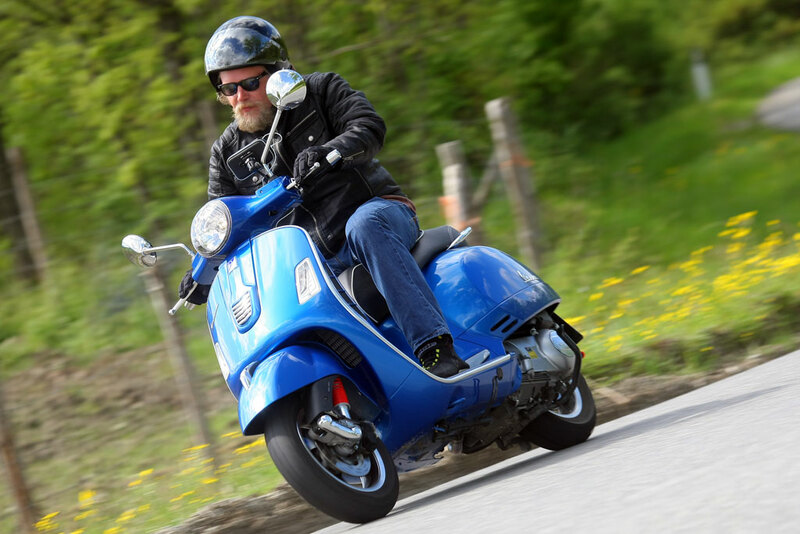 Transitioning from a less-powerful and lighter 125cc scooter is nearly seamless, as everything feels the same – just better and even more comfortable. It’s the ultimate Vespa to grow with. Classic look, folding luggage rack. Dressed in sport colors (rosso dragon, and montebianco), red finish front spring, front grill, and rear right-side grill. No rear folding rack. Same specs as the Super but with specific graphics and saddle.